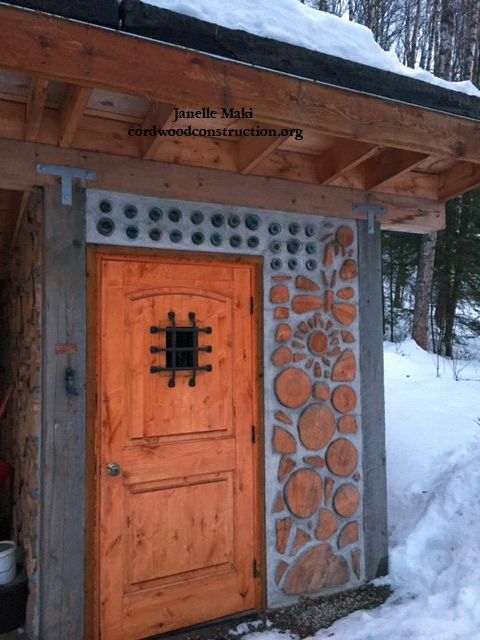 Cordwood Sauna by Cody & Janelle in Big Lake Alaska. 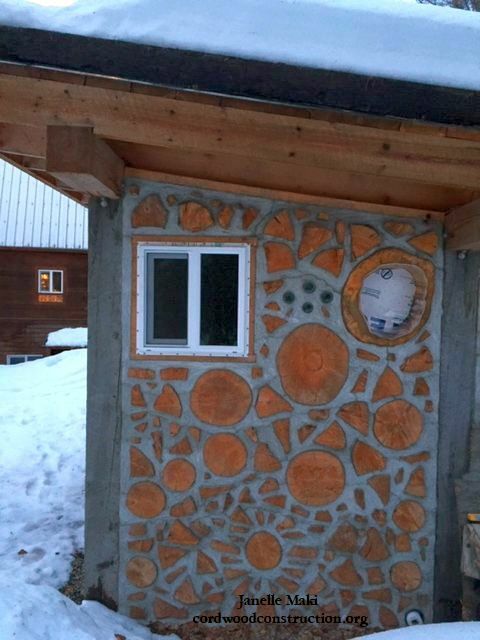 “Hi Richard, Here are pictures of our Sauna/ Hot Tub cordwood building in Big Lake, Alaska. 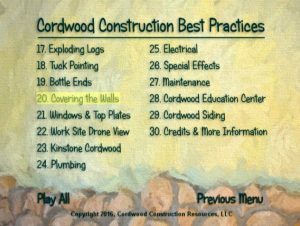 The timber framing was put up by my husband, Cody and all the wood, even the cross beams and rafters are Sitka spruce harvest from Spruce Island (12 miles north of Kodiak) and milled at our local Valley Sawmill. 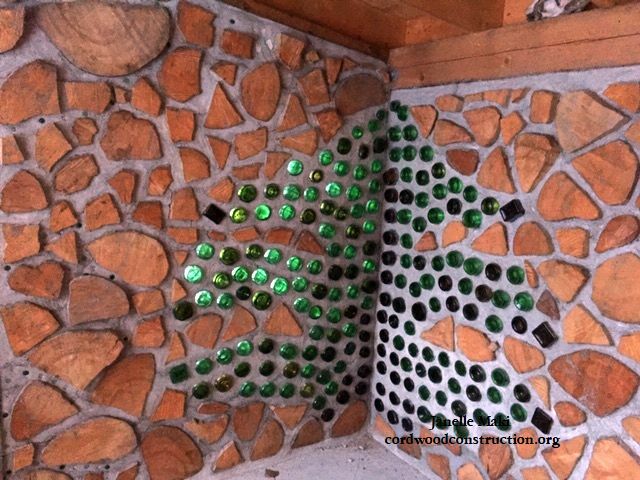 I have completed the cordwood walls during my free time in the summers. 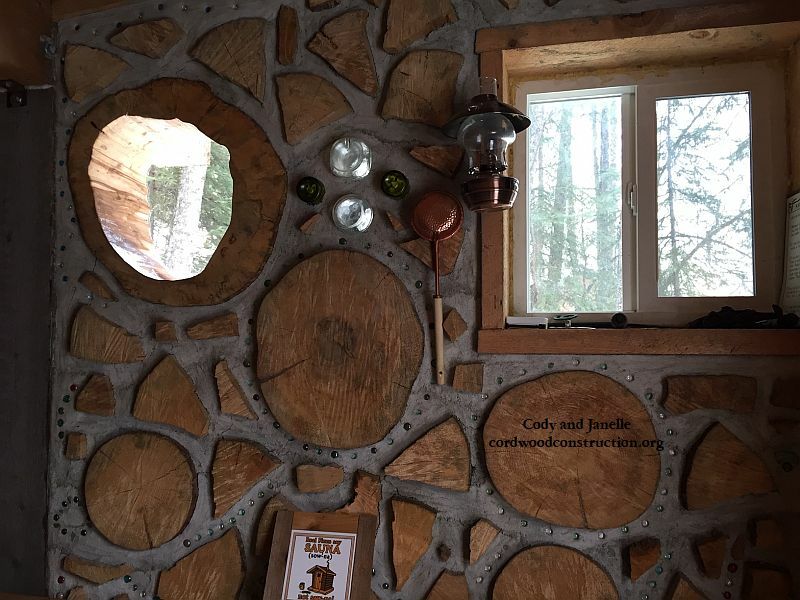 The walls are 9″ thick and mostly Alaskan white pine, with the exception of some pieces of cedar and my hollowed out birch window. It has an earthen roof that we re-purposed from the local Houston High School where I work. It was torn up to put in an artificial turf field. The full-sized bottle end tree I designed and built in the hot tub part of the building in memory of my dad who was a Minnesota Forester for 35 years and passed in 2014. 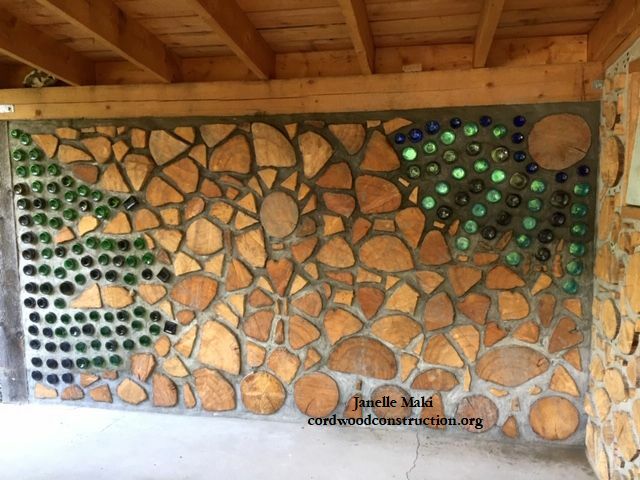 The next wall I intend to build will have a variety of bottle end colors and features, including a glass rifle, cabin and cat bottles. We still have yet to buy a hot tub! 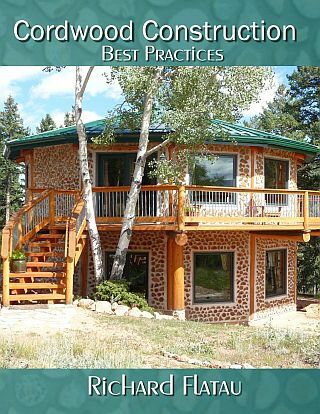 [Look at the book in the bottom of the picture and earn the proper way to pronounce SAUNA (Sow-na)] We live about 20 miles from the epicentre of the 7.1 earthquakes that hit our area and there are at least 2 major fault lines that run right through the Big Lake area. These have been the source of many of the aftershocks since November 30, 2018. 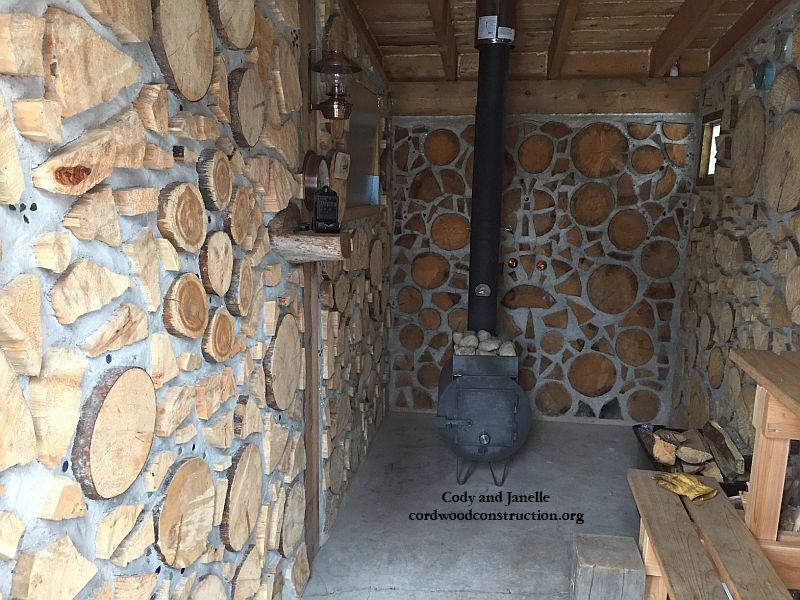 Sauna stove with steam rocks and benches. 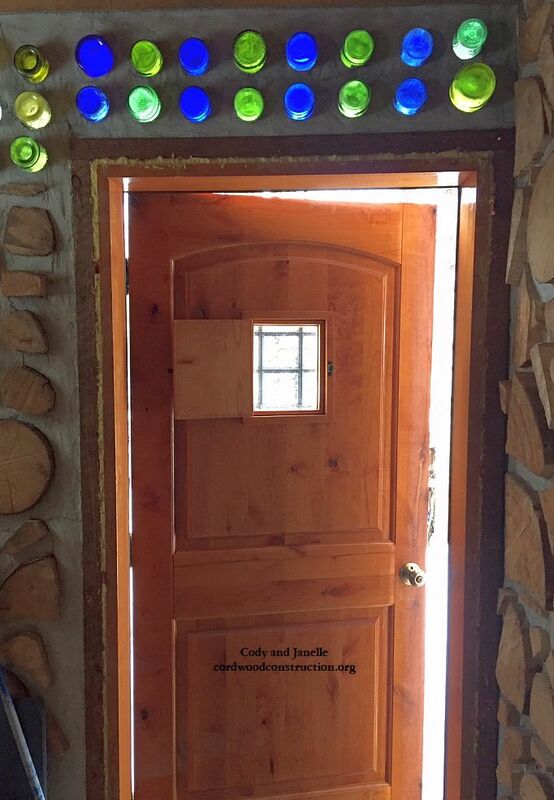 Very nicely done Janelle and Cody. What a beautiful memorial to your father and what a sturdy and attractive work of art! 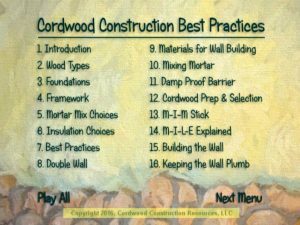 Should you wish to learn how to build a cordwood cottage, cabin or home, please visit www.cordwoodconstruction.org While you are there, click on the pictures, read the brief articles, check out the latest workshops and newsletter and if you are interested click on the Online Bookstore to see all the cordwood literature available in print, video and ebook format.